While snorkeling off on island south of Borneo, in Indonesia, Hofman happened upon a tiny orange seahorse drifting in with the tide. But what began as a pleasing encounter with one of the ocean’s most recognizable animals soon took a heartbreaking turn. 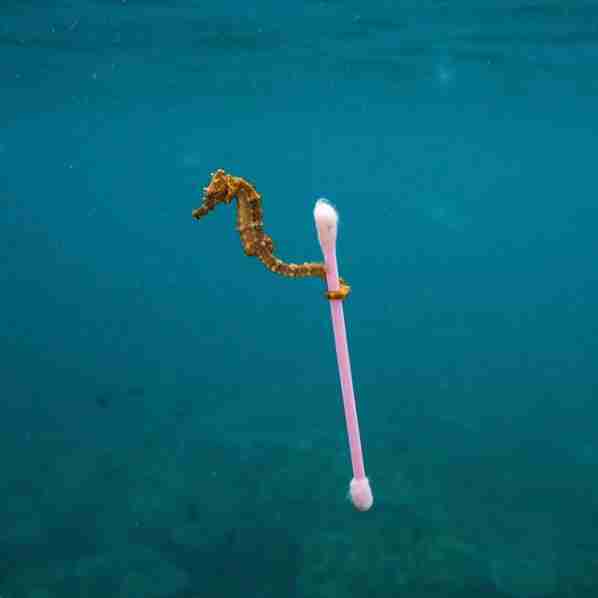 Slowly but surely, pollution in the surrounding waters began to drift in as well — a wave of debris and waste left behind by humans that the little seahorse had no hope of escaping. “To see this little seahorse — it’s heartbreaking,” Hofman said. Hofman’s powerful photo has since gone viral and was selected as a finalist in the London National History Museum’s Wildlife Photographer of the Year exhibition. Instead of acclaim for himself, however, Hofman wants the image to inspire a change in behavior on the part of all who see it. On Saturday, people around the world will gather together to do even more for the planet’s oceans and waterways. Saturday, September 16, is International Coastal Cleanup day, bringing together volunteers in communities across the globe to make a difference for the environment. Chances are, there’s a cleanup even taking place near you — and you can find out where by clicking here. To keep up with the latest issues impacting the world’s oceans, follow SeaLegacy on Facebook. Rumors Are Going Around Claiming That Avon, Estée Lauder and Mary Kay Have Resumed Animal Testing, The Truth Is, They Never Stopped!